Operation Red Nose is a free, designated-driver service, where a team of 3 volunteers drive you and your vehicle home. 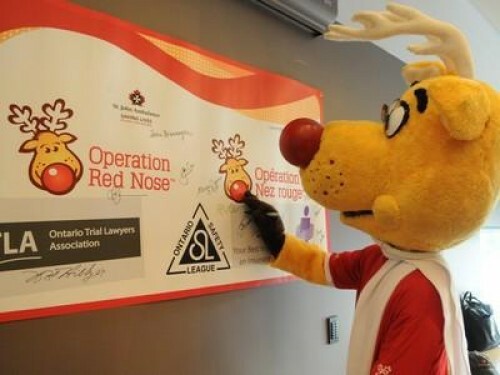 The Insurance Brokers Association of Ontario (IBAO), in partnership with the Ontario Safety League, sponsors the initiative provincially guaranteeing all Red Nose vehicles are properly insured for the 2011 program. This year The Ontario Trial Lawyers Association (OTLA) joined as a provincial sponsor. The association’s over 1300 members know all too well about the mess left behind by drinking and driving. It is their job to assist clients in picking up the pieces after an accident involving a drunk driver, a situation that no one should have to deal with. In an effort to keep the streets safe this holiday season, lawyers from Martin & Hillyer Associates have volunteered their time to provide a safe ride home to Burlington residents who choose to enjoy the holiday season responsibly. Bruce Hillyer, a senior personal injury lawyer with the firm , was the founding President of OTLA. He, along with, Stephen Abraham, David Hayward and James Page, all personal injury lawyers with the firm, will be volunteering to assist with Operation red nose. The program runs on Thursdays, Fridays and Saturdays from 9 p.m. to 3 a.m. from Nov. 25 to Dec. 31 each year, but dates can vary from city to city. Thousands of rides are provided each night of operation across the country. The Burlington campaign will offer Red Nose service on Dec. 2, 3, 9, 10, 16, 17, 23 and 31 between 9 p.m. and 3 a.m.
A team of three volunteers will meet you at your location and drive you and your vehicle to your destination. This will be the third year for Operation Red Nose in Burlington. The city is one of 15 Ontario communities offering the service.